I am feeling quite generous these days, so you’ll get two recipes in a single post. It turns out they went so well together, that it would be sad to separate them. The source of inspiration for the chicken was a blog I found not too long ago, and started following right away: The View from Great Island, hosted by Sue. Her photography is beautiful, and I’d be happy sitting at her dinner table anytime! 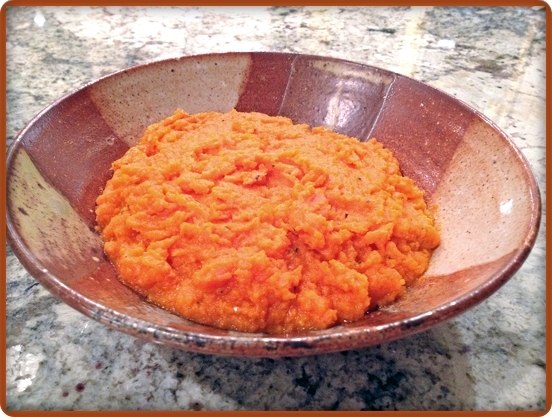 The mashed carrot was in the latest issue of Fine Cooking magazine as an option for Thanksgiving side dish. Roasted asparagus rounded our meal quite nicely. To marinate the chicken, put the yogurt, pomegranate juice, salt, and chicken in a large zip lock bag. Massage everything until well combined. Put in the fridge to marinate for at least 2 hours or overnight. Set the oven to 300 F. Remove the chicken from the marinade, place the pieces skin side down on a large baking dish, and cover with aluminum foil. Bake for 45 minutes to 1 hour at this low temperature. Remove the foil, if there is a lot of liquid accumulated in the dish remove most of it and discard. Turn the pieces skin side up, cover with foil again and bake for another 20 minutes. At this point, prepare the glaze by combining all ingredients together. If too thin, gently warm it on a small saucepan to thicken it a little. Watch it carefully because it can burn due to all the sugar. Remove the aluminum foil from the baking dish, increase oven temperature to 425 F. Bake for 15 minutes, once the skin starts to get some color brush the glaze all over the chicken thighs and bake for 10 more minutes or until very dark. You can also broil the pieces at this point, but pay attention to prevent it from burning. Serve with lime wedges. Put the carrots in a large saucepan with enough cool water to cover by at least 1 inch. Add 1 tsp. salt and bring to a boil. Turn the heat down and cook at a gentle boil until the carrots can be easily pierced with a fork, about 25 minutes. Drain well in a colander, letting the steam rise for a few minutes. Meanwhile, heat the butter, almond milk, oil, mint, orange zest, and 1/2 tsp salt in the saucepan over low heat until the butter melts. Purée the carrots in a food processor until smooth and then add them to the pan, stirring well to combine. 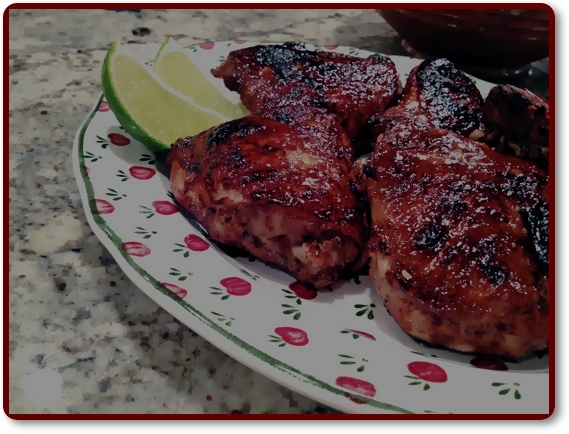 Comments: My main modification of the chicken recipe was to adapt it to my favorite method of cooking chicken thighs: low and slow followed by high and fast. I like the way the meat gets super tender and the skin super crisp. You should stop by Sue’s blog and check her version too. She actually made the glaze from pomegranate juice, reducing it with sugar. Since I had a bottle of pomegranate molasses, I followed a slightly different path. The full idea is to have a reasonably thick glaze to coat the chicken. The carrot mash: my only tweak was to use almond milk instead of heavy cream. I love almond milk and use it every chance I get. 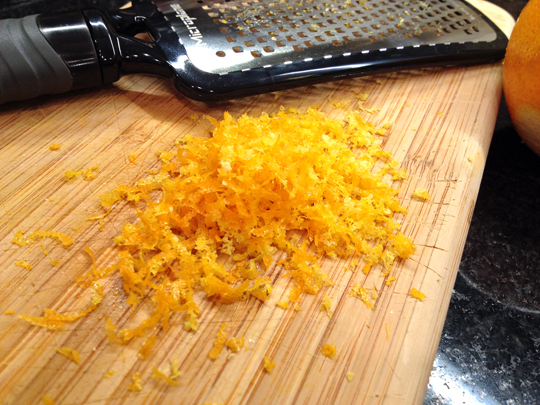 A lot more orange zest went into the recipe then called for, because the music playing got me carried away with the Microplane. Such a cool gadget! Phil thought it was slightly too orange-y and not enough carrot-y, but when we had leftovers next day that flavor had mellowed down considerably. As to a side dish for Thanksgiving, I was a bit shocked by how little puree 2 pounds of carrots produced… If you will be feeding an army of people, be ready to peel a ton of carrots and scale this recipe up by a factor of 3 or 4. 😉 Still, a delicious option, bright color, bright flavor, it will shine on your Thanksgiving table next to that big bird. I want to try that pomegranate chicken recipe right now even if it IS 1am. 🙂 The carrot mash sounds intriguing and certainly looks pretty but I’ll stick with the cream version if I make it, as almond milk is unlikely to make its way onto my shopping list in the near future. I loved the dish for its colour even before I read the recipes. The chicken attracts both for its ingredients but also for your cooking method of low/high temps. As I have a tendency to use boneless chicken thighs have not ovenbaked these often: shall try soonest. Shall make the carrots with the almond milk but may steam rather than boil them methinks . . . thank you!! Love the color on the plate – beautiful dish! Gorgeous color blend on the plate and I can taste the combo in my head and I’d be very satisfied at your dinner table as well! Almond Milk is my go to for my cereal and recently used it to make Chicken Pot Pie for a lactose intolerant client and he loved it and his family never knew the difference! It’s a very useful product. Good job, as always Sally! Love this! So glad to help inspire such a wonderful meal, and I love that carrot mash, the orange and mint combo sounds fantastic! Wish I could have come for dinner! I love the colors! I have never used a slow/fast method for thighs. I’ll give it a try. 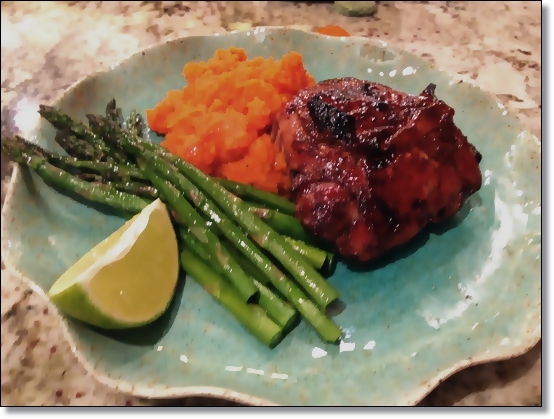 I don’t use any other method when I’m roasting chicken thighs… delicious! Pomegranate.. juice and molasses, what a wonderful glaze for chicken. I really appreciate that you have tips and pointers, I’m the type that wouldn’t have paid attention and would end up burning the glaze/chicken. It does make a lovely pairing with the colorful carrots! Sue really does have some great recipes, doesn’t she? The pom glaze on this sounds lovely! As does the carrot mash you served it with. I wonder if I could sneak this past my family on Thanksgiving in lieu of sweet potatoes…. Tradition is a tricky thing to mess with, but I bet you can get this one pass them! 😉 Just make sure to make more than you think you need. There is a black hole where carrots get sucked into once they are cooked. Seriously, there is. Not a fan of the stuff, I see… 🙂 Check my cauliflower puree with almond milk, it is absolutely delicious! I am in love with this chicken recipe. I know the kids would be too. Mr. N was just extolling all the benefits of the pomegranate to me today and how I need to buy some again this year. 🙂 And I just happen to have a bottle of pomegranate molasses in the pantry. This will be perfect – a meal that all of us will enjoy (with high spoon marks no doubt!). This would have high spoon marks, I am sure! Hope you make it, Kristy! Omg Sally!! I just saw your comment and jumped here asap!! Great minds think alike? or get the same magazine subscription? I thought the mint became stronger the next day, but I simply loved this mash! You’re right it doesn’t seem to make much, but with all the many sides on Tday, it hopefully will be enough for 4-6, unless they love it and want a lot! This looks great with your chicken, I actually have some chicken thighs on hand so maybe I’ll whip this up to go with my leftover carrot mash!! I thought it was great that we both picked the same recipe from Fine Cooking… and posted within a couple of days of each other… too cool! I’m always looking for new ways to use pomegranate molasses in my cooking, so happy to have found this great recipe. I enjoyed visiting your site, lots of good recipes and pictures.